Hailed by D. Shostakovich as his “ingenious successor,” Jevdet Hajiyev is regarded as one of the leading composers of classical music in Azerbaijan. 2017 marked the 100th birthday of this renowned Azerbaijani. To celebrate the centennial of his birth, a series of concert programs were held in some of the finest concert halls of the world in New York City, Austria, Switzerland, France, and in the UK. J. Hajiyev is justly called a groundbreaking composer who delivered a fresh breath to Azerbaijani classical music, especially symphonic music. However, he never abandoned traditional Azerbaijani folklore. The grand art of the Azerbaijani mugham, as well as ashigs, and sonorities of traditional folk instruments such as the tar (plucked lute), kemancha (spike fiddle), and saz (a long-necked folk lute) were sources of inexhaustible inspiration for him. The organic fusion between classical forms and folk music in Hajiyev’s compositions led to unique intonations, melodies, harmonies and exceptional flavor. 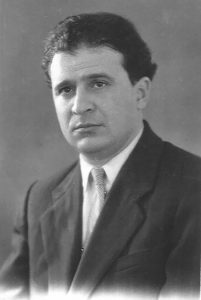 J. Hajiyev left behind a legacy of works that are regarded as masterpieces. Among them: eight symphonies, three tone poems, the opera “Motherland “(Veten) written in collaboration with the prominent composer G. Garayev, string quartets, ballade and sonata for piano, solo and choral works, and many others. These works are among the treasures of classical music that will continue to delight listeners and glorify music of Azerbaijan all over the world. To inquire about sheet music repertoire of Jevdet Hajiyev, please contact floridakeyscompetition@gmail.com, attention Pervin Muradov-Dilbazi.